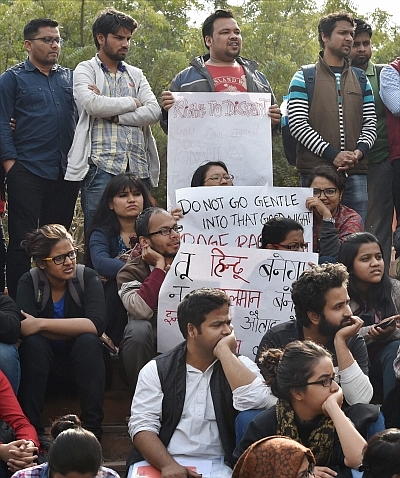 A Delhi government-ordered forensic probe of a set of video clippings of the controversial Jawaharlal Nehru University event has found that two videos were "manipulated" where voices of persons not present in the clips were added. Out of seven videos sent by the Delhi government to the Hyderabad-based Truth Labs, two have been found to be tampered with while the rest were authentic, sources said. "In the manipulated clips, videos have been edited and voices have been added. The main report with a supplementary have been submitted to the Delhi government," they said. When asked whether the voices that were added were of persons not seen in the manipulated clips, they said "naturally". The Arvind Kejriwal led-government had on February 13 ordered a magisterial inquiry into the alleged raising of anti-national slogans on the JNU's campus on February 9. Earlier, a video showing raising of anti-India slogans allegedly by outsiders at the event had given a fresh twist to the case. In the video, the youths, whose faces were covered, could be seen raising slogans against India. Several videos of the event have surfaced since the row broke out leading to the arrest of JNUSU president Kanhaiya Kumar on charges of sedition, triggering widespread rotests. A Delhi court on Tuesday sent JNU students Umar Khalid and Anirban Bhattacharya, also arrested in connection with the same case, to 14 days juducial custody.